Svetlana Alexievich, Voices from Chernobyl: The Oral History of a Nuclear Disaster. One of the main challenges for scholars using qualitative methods is how to incorporate the perspectives of respondents in our writing. The very complexity of each individual narrative, combined with the demands of analysis and conciseness, raises several difficult questions. How much evidence should we include? Which interviews and excerpts are most illustrative of dynamics we want to highlight? In which ways do we ensure that transcription, translation and edition do not interfere with the stories and ideas shared by those we interview? In dealing with these challenges, both literature and journalism can offer useful examples and inspiration. At the crossroads between both fields is the work of Svetlana Alexievich, the Belarusian winner of the 2015 Nobel Prize whose work explores the personal consequences of several tragedies that afflicted Soviet society during the 20th century, from the Great Patriotic War to the invasion of Afghanistan. In particular, Alexievich’s book Voices from Chernobyl (published in Europe under the slightly different title Chernobyl Prayer: A Chronicle of the Future) is an example of the author’s impressive skill at analyzing the 1986 nuclear disaster from the perspectives of those most affected by it. First published in 1997, this work is a collection of oral stories with minimal intervention by the author. Alexievich interviewed five hundred witnesses in the decade after the accident, from soldiers deployed in the cleanup effort and public bureaucrats to displaced inhabitants and relatives of victims. The result is an insightful portrayal of the technological, social and political causes of a major catastrophe, as well as a critical review of its consequences for millions of people and its relation to the collapse of the Soviet Union. Alexievich’s skill lies in her capacity to combine dissimilar stories into a cohesive whole to explore important aspects of the overall tragedy, many of which resonate with the interests of political sociologists and social movement scholars. The book not only refers to the high human and environmental costs of sacrificing safety in the pursuit of economic goals. It also provides a clear example of broader issues, such as the dangers of government secrecy and authoritarianism, the social upheaval brought about by the disruption of quotidian life, and the efforts of individuals to inform and organize themselves in order to confront the effects of an event whose implications they barely understand. For most of us, summers offer a chance to do fieldwork and catch up on new perspectives in our discipline. However, it is also important to take advantage of these months to read other kinds of materials and expand our methodological and disciplinary horizons. 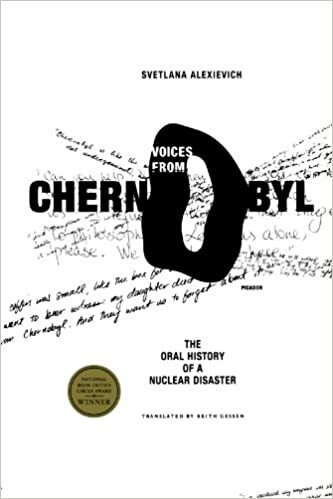 Despite the potential differences between our field of study and the work of writers like Alexievich, Voices from Chernobyl is a powerful lesson on the sociopolitical consequences of major disasters and a useful source of ideas on how to better incorporate testimonies into our analysis. I encourage my colleagues to read this and other books by the same author.